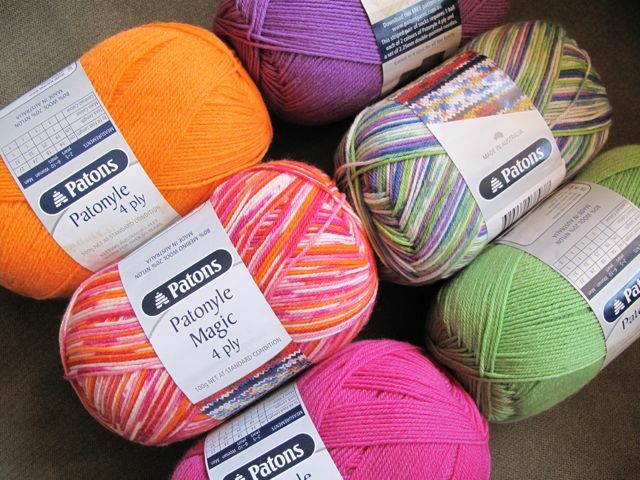 Patons have put out a great new colour range of Patonyle in solids and self-fair isling, and I’ve been stalking the shops to see who would have it on their shelves first. The answer is Clegs! I spied a half-opened box in store at lunchtime yesterday, but I behaved like a ‘lady’ and didn’t rummage through it, although it did kill me a little. I had to return to the city today for something else (I know 40 degrees outside), so I displayed some patience. Funnily the store manager (I think) was chatting to me about the new colour range and said they were just put on shelf today, (no kidding), so I had to play along and say, ‘wow really, aren’t they great!’ so as not to appear like the crazy yarn stalker that I am. I knew when I saw the new colour range on Facebook, I was doomed. The yarn diet or should I say ‘the yarn lifestyle’ had to be put on hold. You see, yarn colours don’t always stick around, nor do yarns. I’ve taken one for the team and purchased these. I’m really not sure that you’ve taken one for the team here Sonia. This post makes me want to buy some too (he, he). PS Thanks for taking care of the Hepburn Springs account.